After another two matches down and with Day 3 at the Under 18 National Championships complete, Queensland, Victoria Country, NSW Metro and ACT/NSW Country are set to battle it out in the semi-finals tomorrow, before the big final tomorrow evening. Full finals fixtures can be found here. NSW Metro extended their unbeaten run to five, as they accounted for the winless Northern Territory in a tough encounter. Batting first, Amber Cloughessy would be the mainstay for Northern Territory hitting 39 off 48 deliveries including four boundaries. Supported well by Ruby Strange (16), the Northern Territory batters looked composed at the crease throughout their innings, yet could not effectively combat the tidy lines and lengths of the Metro bowlers. Economical performances by the likes of Hayley Silver-Holmes (1-17) and Hannah Darlington (1-9), would help Metro restrict Northern Territory to 3-91 off of their 20 overs. With a relatively small total at hand, it would be far from a convincing start for NSW Metro, as three early wickets saw them slump to 3-10, with a major upset well and truly on the cards. It would take a composed 23 by the tournament’s leading run scorer Maddy Darke to get the run chase back on track, before an excellent partnership between all rounder’s Isabelle Arafas (26) and Hayley Silver-Holmes (30) would see Metro get home with three overs to spare. Queensland continued their strong tournament with a convincing win over Western Australia at Canterbury Park. Renee Irvine would be the star for Queensland with the bat, as she came in under pressure at number four to hit 28 off just 31 deliveries to help steer her side to a respectable first innings total. Irvine would be well supported by her middle order, with four Queensland batters hitting double figures. Samantha Quadrio would be the pick of the bowlers for the Western Australian’s as her figures of 3-11 quelled the progress of a big hitting Queensland batting line up. With an achievable target of 110 for victory, the Western Australian top order would be overawed by a stunning spell of fast bowling by Queensland opener’s Courtney Sippel and Emily Vallance. Sitting at 2-0 at the end of the first over, it was always going to be an up hill battle as Queensland seized on their momentum. With none of the top six batters failing to pass one, Western Australia would find themselves at a staggering 7-13 at the five over mark as the simply could not combat the ferocious intent of the Queenslanders. A late innings stand of 21 between Ashlee King (25) and Poppy Stockwell (22) would build some respectability into the total, as Western Australia ended up being dismissed for 74. South Australia improved to a 4-1 record with a tight win against Victoria Metro at Weerona Oval. In form opener Tess Flintoff would get Metro off to a positive start in the first innings, with her 25 proving to be an innings of much poise and patience. After getting to 42 without the loss of a wicket, the floodgates would then open as the South Australian bowlers began hitting their lengths to great effect. A collapse of 8-40 would put South Australia back in the drivers seat heading into the second innings with the target for victory set at 85. It would be disaster early for the South Australian’s however as opener Stephanie Beazleigh was run out without facing a ball. Her departure would be followed by the majority of the top order as they slumped to 5-32, as Metro smelt a most unlikely victory. It would take small contributions by Katie Rowe (15), Tarlee Meaney (15), Laura Niejalke (13) and Sophie Roberts (10) to help revive the South Australian chase as they managed to sneak home by two wickets. The Cricket Australia XI have romped to their second win of the tournament, defeating Tasmania by nine wickets. Bowling first, the CA XI were on from the outset, claiming three early wickets to have the Tasmanian’s whimpering at 3-8. With her side in all sorts of trouble, Ella Marsh (24) would go about resurrecting the innings as alongside opener Amy Rose Duggan (16), they would see the Tasmanians past the 50 mark and give them hope of posting a respectable total. However, following Duggan’s departure the Cricket Australia XI would regain control of proceedings with a collapse of 5-18 seeing them post a lowly score of 72. It would be a positive run chase from the outset by the CA XI, as openers Kayla Burton (32) and Ruth Johnston (26) would continue the good work put forward by the bowlers with some exquisite batting. The pair would put on 68 of the required 72 in the opening stand, as the Tasmanian bowlers simply had no response for the class and poise of the duo as they cruised to victory in just 9.2 overs. ACT/NSW Country claimed a crucial four wicket victory over Victoria Country to remain in second position of pool A.
Batting first at Harry Trott Oval, Victoria Country would be dealt a major blow early as opener Lucy Cripps departed on just the third ball of the innings. This would bring wicket keeper Alyssa Humphries (24) to the crease, who together with Merinda Hale (22) went about salvaging the innings with a 46 run partnership. With the innings delicately poised, ACT/NSW Country would again regain control thanks to an excellent spell of bowling by Alisha Bates who’s figures of 2-18 were the catalyst to a late collapse of 6-9. Chasing a lowly 83 for victory, it was a rocky start for the ACT/NSW Country side as they would lose both openers in the early stages to be sitting at 2-27. However, a class innings of 40 by Anika Learoyd at number three would set the foundation of the run chase as the remainder of the team was able to bat around the in form batter to see ACT/NSW Country home for a crucial victory. Sarah Young was the standout performer for round six as she smashed her way to her second half century of the tournament to lift ACT/NSW Country to a monster first innings total of 6-169. The competitions second leading run scorer was on from the outset as she displayed a mixture of power and poise on her way to 53 off just 45 deliveries. Young would be well supported by fellow opener Alisha Bates as the pair put together an 88 run partnership. A solid spell by Chloe Abel (2-9) would help Tasmania wrestle back some momentum in the middle overs, before all rounder Abby Taylor came to the crease and plundered 37 off just 21 to end the innings on a major high for ACT/NSW Country. Needing an unlikely 170 for victory, it was a similar story for Tasmania as a mid order collapse of 5-16 in the middle overs ensured a large defeat. Amy Rose Duggan (21) and Emma Manix-Grieves would be the only Tasmanian’s to reach double digits, as the batting lineup crumbled to end up with a lowly total of 83. 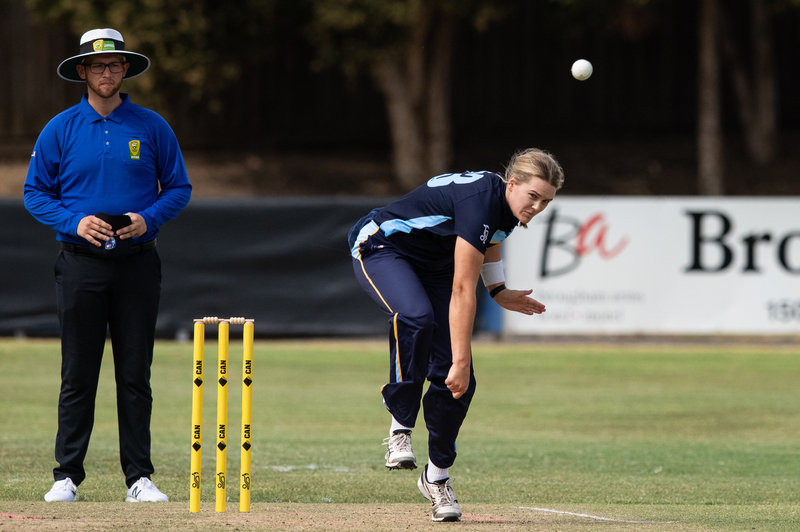 Gabrielle Sutcliffe would be the pick of the bowlers for ACT/NSW Country with figures of 3-17, while Anika Learoyd’s excellent tournament continued as she took 1-20. NSW Metro had yet another perfect day at the championships as they cruised by Western Australia to remain undefeated. Batting first at Dower Park Recreation Reserve, it was Stella Cambell’s time to shine for Metro as the talented middle order batter anchored the innings with an impressive run a ball 42. Elise Noble (21) and Maddy Darke (13) were also pivotal to Metro’s batting effort as some big overs towards the end saw them get up to a solid 119. Looking to create a major upset, Western Australia were again let down by their batting department as six scores of one or below saw them struggle to trouble the Metro side. Isabella Malgioglio continued her outstanding tournament with impressive figures of 4-9 which included two maidens, while opener Hannah Darlington was also brilliant taking 2-9. Some late hitting by Emma June Davidson (30*) would act as only a consolation prize for Western Australia as NSW Metro enjoyed a comfortable 42 run win. Queensland picked up their second win of the day, crushing the winless Northern Territory by ten wickets. After winning the toss and batting first, the Northern Territory never got going with wickets falling at regular intervals. Courtney Sippel backed up her sizzling round five performance with another excellent spell, claiming figures of 1-9, while Stacy Rockliff was extremely economical with figures of 1-2 from her three overs. Amber Cloughessy was the only Northern Territory batter to show any resistance, as she anchored the innings with a patient 24 from 44 deliveries. In reply, Queensland would assert their dominance from the outset as openers Caitlin Mair (32) and Sippel (22) guided their side to victory in just 7.4 overs. The Cricket Australia XI continued their good form with a comprehensive win over Victoria Metro at Weerona Oval. Phoebe Litchfield was the standout performer for the CA XI, as she continued her good form with a maiden half century of the tournament to see her side to a big first innings total. Middle order batter Kayla Peterson (19), Ella Hayward (13) and Molly Godsel (18*) served as excellent support for Litchfield, as the Metro bowlers simply had no answer for the young talented batting line up. Needing 133 for victory, Metro would struggle to get anything going with bat in hand as although captain Tess Flintoff played a superb knock of 35, no other batter could get past five in a dismal run chase. Isabella Greig was the pick of the bowlers for the CA XI, claiming figures of 2-11 from her three overs, while Ruth Johnston continued her good tournament with figures of 1-9 off three overs.